Interview with Rob van der Werf, director of New Business Development for ASML. ASML builds the machines that make the digital age possible. Their semiconductor technology has become the industry standard to the point the Veldhoven-based company has a solid leading position in the photolithography sector. ASML’s photolithography machines use a photography-like process to make computer chips in which integrated circuits are optically imaged onto a silicon wafer covered with light-sensitive material. ASML’s optical imaging machines are used in the fabrication of nearly all integrated circuits, are the size of a room and sell for more than 50 million euros per copy! ASML is a member of the Eindhoven Startup Alliance, which includes Philips, NTS, High Tech Campus, ABN AMRO and local economic-development agencies. The goal is to help HighTechXL accelerate 100 startups through 2020. We wanted to find out from one of the top executives at this high-tech company how ASLM sees the roles of startups in this giant ecosystem. Rob van der Werf, director of Strategic Business Development for ASML, was kind enough to sit down with us during a recent HighTechXL Demo Day, hosted by ASML at its headquarters. 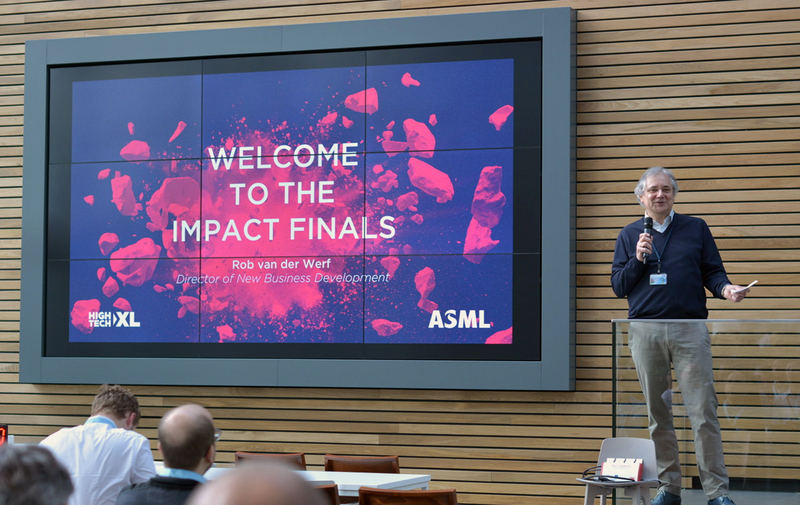 To our surprise, the first thing van der Werf said was that startups are ”not at all” important to ASML keeping its competitive edge. HTXL: So why are you here today? Rob van der Werf: If you look at ASML, we’re now a little over 30 years old. Not so long ago, we would have called ourselves a startup. Actually, we want to keep that idea because it has a nice ring, and it’s the mentality which helps us to pursue high-paced innovation roadmaps. That’s difficult because there’s increasingly more complexity in the roadmap. When I started at ASML 18 years ago, we had just over 1,000 engineers in R&D. Now we have 7,000. You can’t say, “We do seven times as much as then.” No, it doesn’t work like that. “How do you manage them to keep fulfilling industries expectations?” That’s another discussion. We can only fulfill that if we have enough resources here to work. That means if you only have one product, and 7,000 engineers working on it, they’re very, very much focused. So we have groups that focus on a module of a module of a module. If we encounter a really difficult problem, we typically solve that by freeing up ample R&D resources, and if that doesn’t work, we may open up another few cans of engineering power. That’s typically how we do it. In that dynamic, you cannot rely on startups. There are other reasons we work with startups. For instance, the way ASML conducts its business makes us very much depending on a good functioning high-tech supply network in this region. Therefore, a stronger regional high-tech eco system is helping us. Supporting relevant startups makes the region more capable to attract relevant talent, sustain talent and maybe create innovative ideas that are at some point helpful to us. I’m not saying it’s not possible that we’ll work with startups. I’m just saying it’s not what we’re relying on. Well, if that team working on the module of a module of a module … maybe there’s a startup team with the expertise to do things you can’t do quickly. I saw the first efforts by General Electric in the U.S. back in 2011 to turn to startups and hackers to solve problems they couldn’t solve. Let’s be fair … GE is a multi-product company with many divisions which are essentially smaller companies. That’s a completely different thing than having a 21,000-person company – which is only designing modules and putting them together – and the supply network that has a multiple of that number of people supplying the modules. All to make one solution for the semiconductor industry. So that’s not comparable. But, I like your suggestion and it would be great if we could find some convincing examples. There were indeed a few startups recently that, although we had some solutions ourselves to problems already, their solutions could even be better. A nice example was a startup offering a solution to a 10-fold bandwidth (increase) of an existing glass fiber cable. Obviously, no one at ASML would be interested in that. But once these guys explained their technology to our research people, they replied, “Well, if you can do that, can’t you do this, as well?” And so, we started a dialogue. That happened a year ago and now we’re still in the evaluation stage. For a startup, that’s like endless and is the wrong dynamic. But at least we start to see other solutions are possible. If we could show a few successful examples, people might change their minds and accept the need for adapting the current way of working. In the Valley, the dynamic is so different. Here, the current tech companies – ASML, NXP, Shapeways – all came out of Philips. Out of one company. I’m not saying one way is better. I think it’s really terrific if you have a big multinational that keeps spinning out these creative teams. Will ASML spin out really creative teams? Looking at the type of companies we can support – this is what we do with our startup alliance with Philips, NTS, ABN AMRO, HTC, the BOM and TU/e – we are aiming for companies with a high potential in the high-tech (hardware) industry for which the competence and know-how of the Alliance members could make a difference. Typically for those companies, it’s a completely different dynamic as compared to companies you would find, for instance, in the Bay Area. There, things go much faster. You can assess (startups) much faster. You can invest at a lower level. You see very quickly if there’s a benefit and you need to invest more. Here, if you want to invest in a high-tech manufacturing company, the pace of progress is slower. Investments are higher. Therefore, the risks are higher. I think that’s also why we think we have a chance here in the region because we are committed to make that happen. We understand the risks. We understand what it takes, especially if the technical competence is an expertise which ASML has – mechatronics, system engineering or optics – or Philips has, image processing and building big systems. What we share is based on what we’re very good at, like building very, very complex manufacturing systems. This is where we can play a role, where we can make a difference. We should be able to attract these kinds of startups. Providing support could also create a new internal culture ASML can benefit from. Already now we see that all the young people we hire from various universities around the world think differently as the previous generation. They easily spend a day of their weekends to support startups just to be engaged. Facilitating this also creates a dynamic engagement that helps up promote working for ASML or anywhere else in this challenging high-tech manufacturing eco-system.